In Old Testament times, dresses were made in such a manner that as they looked at them they were reminded of the commandments of God, and encouraged to obey them. In their dress they were not to seek after their own hearts, nor their own eyes. If they did, they would copy the fashions of Babylon. Garments were ever taken as an emblem of the righteousness of Christ, and when different substances as linen and wool were mingled it spoiled the figure. Foolish fashions are not confined to modern days, but have been in existence from early times. All of the fashions named here, are used in some part of the world today. When the “daughters of Zion” followed the fashions of the world, it caused Zion to sit upon the ground desolate. Isaiah 3:16 Moreover the LORD saith, Because the daughters of Zion are haughty, and walk with stretched forth necks and wanton eyes, walking and mincing [as] they go, and making a tinkling with their feet: 17 Therefore the Lord will smite with a scab the crown of the head of the daughters of Zion, and the LORD will discover their secret parts. 18 In that day the Lord will take away the bravery of [their] tinkling ornaments [about their feet], and [their] cauls, and [their] round tires like the moon, 19 The chains, and the bracelets, and the mufflers, 20 The bonnets, and the ornaments of the legs, and the headbands, and the tablets, and the earrings, 21 The rings, and nose jewels, 22 The changeable suits of apparel, and the mantles, and the wimples, and the crisping pins, 23 The glasses, and the fine linen, and the hoods, and the veils. 24 And it shall come to pass, [that] instead of sweet smell there shall be stink; and instead of a girdle a rent; and instead of well set hair baldness; and instead of a stomacher a girding of sackcloth; [and] burning instead of beauty. Isaiah 3:26 And her gates shall lament and mourn; and she [being] desolate shall sit upon the ground. It was only a firm trust in God that enabled the women to dress plainly and ignore the fashions of the world. After Jacobs’s daughter had been disgraced, Jacob drew near to God. He then saw that their manner of dressing was like the world, and he called upon his family to change their garments and hide their ornaments. Genesis 35:1 And God said unto Jacob, Arise, go up to Bethel, and dwell there: and make there an altar unto God, that appeared unto thee when thou fleddest from the face of Esau thy brother. 2 Then Jacob said unto his household, and to all that [were] with him, Put away the strange gods that [are] among you, and be clean, and change your garments: 3 And let us arise, and go up to Bethel; and I will make there an altar unto God, who answered me in the day of my distress, and was with me in the way which I went. 4 And they gave unto Jacob all the strange gods which [were] in their hand, and [all their] earrings which [were] in their ears; and Jacob hid them under the oak which [was] by Shechem. 5 And they journeyed: and the terror of God was upon the cities that [were] round about them, and they did not pursue after the sons of Jacob. 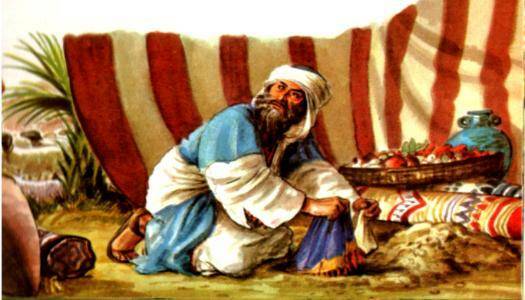 Achan coveted the Babylonish garment and lost his place in Israel. Joshua 7:20 And Achan answered Joshua, and said, Indeed I have sinned against the LORD God of Israel, and thus and thus have I done: 21 When I saw among the spoils a goodly Babylonish garment, and two hundred shekels of silver, and a wedge of gold of fifty shekels weight, then I coveted them, and took them; and, behold, they [are] hid in the earth in the midst of my tent, and the silver under it. 11 Israel hath sinned, and they have also transgressed my covenant which I commanded them: for they have even takenof the accursed thing, and have also stolen, and dissembled also, and they have put [it] even among their own stuff. Posted on September 1, 2009, in Short Studies and tagged Dress Reform, modest dressing, modesty, seventh day adventist. Bookmark the permalink. Leave a comment.